The UK annexed Southern Rhodesia from the [British] South Africa Company in 1923. A 1961 constitution was formulated that favored whites in power. In 1965 the government unilaterally declared its independence, but the UK did not recognize the act and demanded more complete voting rights for the black African majority in the country (then called Rhodesia). UN sanctions and a guerrilla uprising finally led to free elections in 1979 and independence (as Zimbabwe) in 1980. Robert Mugabe, the nation's first prime minister, has been the country's only ruler (as president since 1987) and has dominated the country's political system since independence. His chaotic land redistribution campaign, which began in 2000, caused an exodus of white farmers, crippled the economy, and ushered in widespread shortages of basic commodities. Ignoring international condemnation, Mugabe rigged the 2002 presidential election to ensure his reelection. 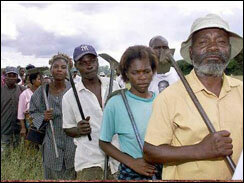 Opposition and labor strikes in 2003 were unsuccessful in pressuring Mugabe to retire early; security forces continued their brutal repression of regime opponents. The ruling ZANU-PF party used fraud and intimidation to win a two-thirds majority in the March 2005 parliamentary election, allowing it to amend the constitution at will and recreate the Senate, which had been abolished in the late 1980s. In April 2005, Harare embarked on Operation Restore Order, ostensibly an urban rationalization program, which resulted in the destruction of the homes or businesses of 700,000 mostly poor supporters of the opposition, according to UN estimates. ZANU-PF announced in December 2006 that they would seek to extend Mugabe's term in office until 2010 when presidential and parliamentary elections would be "harmonized." The government of Zimbabwe faces a wide variety of difficult economic problems as it struggles with an unsustainable fiscal deficit, an overvalued exchange rate, soaring inflation, and bare shelves. Its 1998-2002 involvement in the war in the Democratic Republic of the Congo drained hundreds of millions of dollars from the economy. The government's land reform program, characterized by chaos and violence, has badly damaged the commercial farming sector, the traditional source of exports and foreign exchange and the provider of 400,000 jobs, turning Zimbabwe into a net importer of food products. Badly needed support from the IMF has been suspended because of the government's arrears on past loans, which it began repaying in 2005. 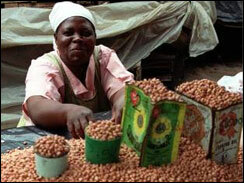 The official annual inflation rate rose from 32% in 1998, to 133% in 2004, 585% in 2005, and approached 1000% in 2006, although private sector estimates put the figure much higher. Meanwhile, the official exchange rate fell from approximately 1 (revalued) Zimbabwean dollar per US dollar in 2003 to 160 per US dollar in 2006.